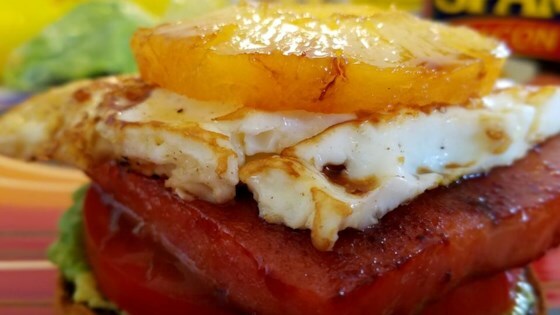 "A golden bagel is topped with tomato, eggs, pineapple, avocado, and just a splash of balsamic vinegar to balance it all out." Place pineapple slices in a non-stick skillet over low heat; sprinkle with brown sugar. Cook pineapple, shaking the pan every minute, until bottom of pineapple rings turn golden and sugar is caramelized, about 5 minutes; remove slices from pan and set aside. Place SPAM(R) with Bacon slices into the same skillet and pour 1/4 cup of reserved pineapple juice over the SPAM(R) with Bacon; cook until juice evaporates, about 3 minutes. Flip SPAM(R) with Bacon; pour remaining pineapple juice in and cook until evaporated, about 3 minutes more. Crack eggs into a nonstick skillet over medium-low heat; cook until whites are firm and yolks are done to your liking. Toast bagels; spread bagel halves with mashed avocado. Top each bagel half with tomato slices, SPAM(R) with Bacon slices, an egg, and a pineapple slice; top with just a splash of balsamic vinegar.